Medical Education, Health and BioEthics Department of UGM has developed a programme, FAIMER Regional Institute of Indonesia for Educational Development and Leadership (FRIENDSHIP). In cooperation with Philadelphia-based Foundation for Advancement of International Medical Education and Research (FAIMER) Institute, the program is developed to enhance capacities of paramedics in Indonesia and countries in Southeast Asia. “FAIMER is well-known for developing medical education. 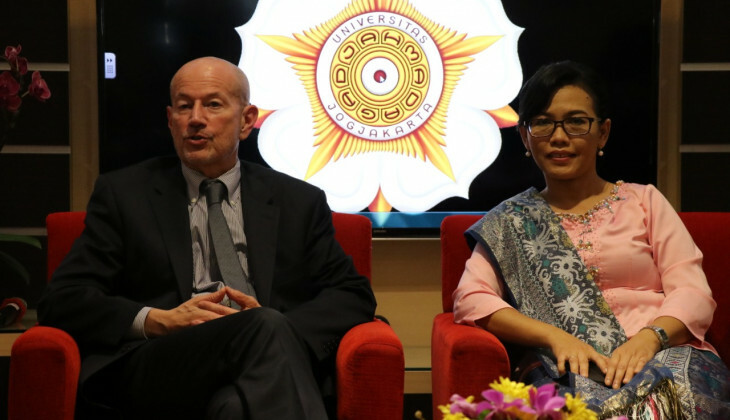 Now UGM became one of 11 FAIMER Regional Institutes, or the first in Southeast Asia,” said Vice-Dean of Academic and Student Affairs, dr. Gandes Retno Rahayu, M.Med.Ed., Ph.D., officiating FRIENDSHIP programme on Tuesday (5/3). With UGM, the institution offers 2 programme, FRIENDSHIP tailor-made to Master in Medical and Health Professions Education (MPHE), as well as fellowship programme for 2 years with blended learning model. “The blended learning programme is suitable for working medics who have no time to take graduate level education,” said chairperson of FRIENDSHIP, dr. Mora Claramita, MHPE., Ph.D. FRIENDSHIP participants, said Mora, were practitioners, researchers, and lecturers. The training covers health research development, leadership, quality assurance, and others. The participants will also conduct residential training twice at UGM. President of FAIMER Philadelphia, Prof. John J. Norcini, MD.,Ph.D., said that the programme would not only make improvements to health education institutions, but also make real change in society. “The programme allows paramedics to get training without having to travel far to the US. We will see the development of the people that have completed the programme and many of them have shared what they had learned and trained more people,” he said.